If you are looking professional Haunted House in Lucknow, Vimsiya Royal Impex India Pvt. Ltd. is the only name to look for. We give you an edge of a seat experience with our newly developed The Haunted House. So get ready to grove with the ghosts with our Haunted House Services, without burning holes in your pockets. We offer such services for shopping malls and amusement parks as per the requirement. Plus, we have a buch of wild, creepy and horrifying sound effects, to achieve a much more realistic view. 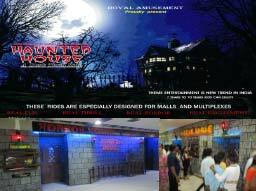 Using Animatronics Technology, we can construct these horror houses in an area – 800 to 1000 Sq. ft. (carpet).